A German hospital was recently sued for medical malpractice after surgeons allegedly left 16 surgical instruments inside of a cancer patient’s body during a 2009 operation. Although this may be the most radical example of gross hospital and doctor negligence covered by the media in quite a while, complications that result from preventable surgical errors are not as uncommon as many people think. If you or a loved one has suffered adverse side effects, injury or even death due to a surgical error, you may have a medical malpractice claim and be eligible for compensation. Contact Ward Black Law today. Surgery performed on the wrong patient altogether. This weekly error estimate stems from a review of medical liability settlements and judgments made between 1990 and 2010. Researchers found a total of nearly 10,000 cases, totaling $1.3 billion in settlements. There are many other common types of surgical errors, including drug and dosage mistakes, anesthesia mistakes, blood transfusions with the incorrect blood type and, simply, failure to perform the surgery correctly, resulting in harm or death of the patient. Surgical mistakes are often associated with the most complex surgeries, such as heart, spine, and brain operations; however, surgical errors are also reported in some of the most common surgical procedures, including colon, gynecological, vascular, sinus and laser vision correction surgeries. Unfortunately, no matter the type of surgery, the complications resulting from surgical errors can be equally dire. If you have been a victim of a surgical error resulting from hospital/doctor negligence, you may be entitled to compensation for medical expenses, disabilities, lost wages, pain, suffering and more. 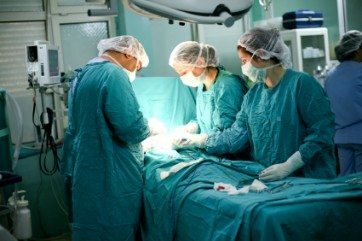 To learn more about filing a surgical error lawsuit, contact Ward Black Law today for a free case evaluation and the answers to your questions.